Nepal: Madhesi Movement Has Lost Steam With Disunited Leadership – Analysis - Integration Through Media ....! The Madhesi Movement which started with a momentum of its own in 2007 has somehow lost its way despite widespread and serious agitations in 2008 and 2015. 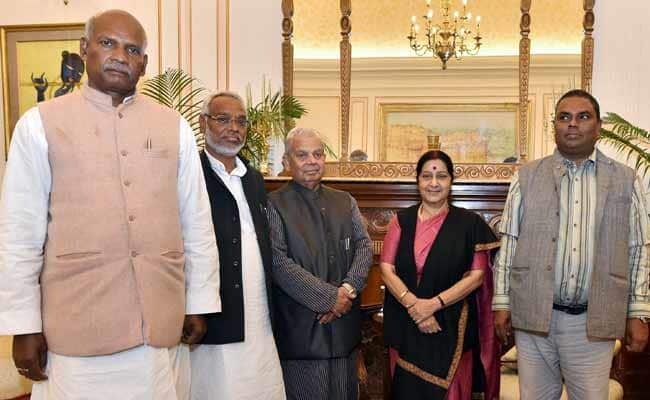 The stage has come when its leadership spread under the two groups the SSF (N) and the RJP (N) has come to literally begging the top Government leadership to grant them some concession to save their faces and to justify the tremendous loss of lives and property of innocent Madhesis over the last 12 years. Starting from Vedanand Jha to the present Madhesi leadership of Upendra Yadav, Mahant Thakur and Rajendra Mahato, the poor Madhesis have been let down time and again with only the leadership benefitting from the ‘so called’ reconciliation and not the average poor Madhesi who continues to struggle for his/her day today existence! Dissatisfaction still persists in Madhesh regions (Terai) among all Madhesis uniformly and the present Government led by K.P.Oli to others earlier, like G.P., Adhikari, Sushil Koirala and even Deuba, had done nothing in the past to bridge the growing divide between the Hills and the Madhesh. One exception was some feeble attempts made by Maoist Chief Dahal aka Prachanda during his brief tenure as Prime Minister. The Madhesi leaders are themselves to blame for this sorry state of affairs. They have never been united in the past nor would they do so in future. The unity they now show in running Province No. 2 of the Madhesi area is too fragile and it is a miracle that they have continued to function together. There have been two Prime Minsiters (three if you include- Gachhadar, a Tharu), One President, one Vice President and many others in very senior positions and nothing has altered the position of Madhesis. It should not be forgotten that the present Constitution, considered to be very discriminatory one was promulgated in 2015 by the Nepali Congress led by Sushil Koirala and ably supported by the Maoist Chief Dahal! The Madhesh Movement began on January 19, 2007 when a young Madhesi student Ramesh Mahato, 16 years old was gunned down by a senior cadre of the Maoists. It was a milestone in Nepal’s politics that saw the rise of Upendra Yadav who had researched and quietly in his own way had been fighting for the rights of the Madhesis. It is a pity that he has now joined Oli’s government as a Deputy Prime Minister with all the perks and privileges and now reduced to issuing periodic appeals to Oli to make good his oral commitment made to get him on to his Government! The other group still making noise with leaders like Mahato and Mahant Thakur threatening to withdraw support periodically and with Oli doing nothing has become a “laughing stock”! There was another round of agitation in 2008 when it looked that finally the Madhesi would get some justice, but the plot was lost by the Madhesi leaders themselves who could not agree amongst themselves on the way forward. The agitation that followed soon after the promulgation of Constitution on September 20, 2015 was the most widespread that caused immense damage to the lives and properties of the Madhesis. Though the official figures say that about 50 died , many more lives were lost. In the process India got a bad name too for allegedly supporting a road blockade for over two weeks! Among many demands periodically put forth, there are three major issues on which all the three agitations were based. These were1. Electoral Constituencies on the basis of population 2. Proportional representation in all wings of government and 3. Federalism. There has been some progress on federalism with the Madhesis having most of the Madhesi districts in Province No. 2 leaving two districts in the East and two in the West. It is here that the Madhesi groups could do something as the Government in the Centre has still not reconciled itself over empowering the provinces. The latest bill on Police is one such Act that should be opposed vigorously by Provincial leadership as the bill goes very much against the very concept of federalism. The Bill envisages deployment of all provincial chiefs by the Federal Government, procurement of arms and ammunition for local use by the Provinces only on approval of the Centre, CDOs appointed to act outside the jurisdiction of the Provinces and even recruitment of provincial police, filling up of vacancies , syllabus for training will all be determined by the Federal Government. Since all other provinces are governed by the Ruling Party, Province No. 2 alone can challenge the Federal Government. Similarly, the anomalies in the citizenship laws and getting citizenship for a large number of Madhesis who are still stateless should be the immediate priority. It is not that proportional electoral representation and inclusiveness in all wings of the Government should be given up but these would take a long time that would need a change in the mind set of the majority community too. Similarly, the younger leaders of the Madhesi Groups should also review their leadership and see what could be done to get them to be more selfless and active for the good of the people and if not to look for younger ones to continue the work they had been doing.